Showerlay Line is a Walk in Shower Tray designed for installation in wet room tiled floors. It's main advantage is premachined slope towards the drain on the entire former surface. Stainless steel linear shower drain is located parallel to the shorter edge. It's a complete Wet Room Tray Linear Drain with McAlpine waste trap included. While End Drain Shower Base is more expensive than one with square, it looks significantly better in every bath. Technical properties of a linear drain shower tray are usually the same as those of ones with square drainage, although they more beautiful. Wetroom shower tray linear drain available in our store has 10 years of warranty, which gives you that peace of mind so it will work without any problems for a long time. Former comes with integrated and waterproofed stainless steel linear channel, suitable McAlpine siphon trap with 26 l/min capacity and grate. Pure is a slot cover, should be filled with tiles so after the installation only visible part of the tray would be the channel. Drainage is 500 mm long and 80 mm wide while grating width is 64 mm. It protrudes above the shower tray by 15 mm and below by approximately 5 mm. Steel is finished with a brush, which is practical and particularly suitable for most architectural applications. Preformed 800 x 800 mm board is the smallest square shaped tray we offer. It allows you to create an elegant shower, even in a small bathroom. It will not only look beautiful but will offer easy, step-free access. Former comes with integrated and waterproofed stainless steel linear channel, suitable McAlpine siphon trap with 26 l/min capacity and grate. Ponente grating is a plain bar of brushed steel cover with no holes, only channels aside. Drainage is 500 mm long and 80 mm wide while grating width is 64 mm. It protrudes above the shower tray for 15 mm and below for approximately 5 mm. Steel is finished with brush, which is practical and particularly suitable for most architectural applications. Preformed 800 x 800 mm board is the smallest square shaped tray in our offer. It allows you to create elegant shower even in small bathroom. It will not only look beautiful but will offer easy, step-free access. Former comes with integrated and waterproofed stainless steel linear channel, suitable McAlpine siphon trap with 26 l/min capacity and grate. Grate Mistral has a row of various sized circles regularly covering the surface. Drainage is 500 mm long and 80 mm wide while grating width is 64 mm. It protrudes above the shower tray for 15 mm and below for approximately 5 mm. Steel is finished with brush, which is practical and particularly suitable for most architectural applications. Former comes with integrated and waterproofed stainless steel linear channel, suitable McAlpine siphon trap with 26 l/min capacity and grate. Zonda is a grill with angled rectangles across the entire top cover. Drainage is 500 mm long and 80 mm wide while grating width is 64 mm. It protrudes above the shower tray for 15 mm and below for approximately 5 mm. Steel is finished with brush, which is practical and particularly suitable for most architectural applications. Former comes with integrated and waterproofed stainless steel linear channel, suitable McAlpine siphon trap with 26 l/min capacity and grate. Tivano cover has 4 L-shaped rectangles with a square in the centre pattern. Drainage is 500 mm long and 80 mm wide while grating width is 64 mm. It protrudes above the shower tray for 15 mm and below for approximately 5 mm. Steel is finished with brush, which is practical and particularly suitable for most architectural applications. Former comes with integrated and waterproofed stainless steel linear channel, suitable McAlpine siphon trap with 26 l/min capacity and grate. Sirocco cover holes pattern consists 3 rows of squares, parallel to drain edge. Drainage is 500 mm long and 80 mm wide while grating width is 64 mm. It protrudes above the shower tray for 15 mm and below for approximately 5 mm. Steel is finished with brush, which is practical and particularly suitable for most architectural applications. Suitable shower drainage is included to former, it comes with 600 mm long steel linear end drain. It also comes with grating which is 64 mm wide, leaving 8 mm wide channel for water to flow. Ponente grating is a plain bar of brushed steel cover with no holes, only channels aside. Height from the shower tray surface to the top edge of vertical upstand is 15 mm, it also goes below the tray for approximately 5 mm. McAlpine siphon trap with capacity of 26 l/min and 20 mm high water seal is also included. Showerlay is complete unit with everything you need. Suitable shower drainage is included to former, it comes with 600 mm long steel linear end drain. It also comes with grating which is 64 mm wide, leaving 8 mm wide channel for water to flow. Zonda is a grill with angled rectangles across the entire top cover. Height from the shower tray surface to the top edge of vertical upstand is 15 mm, it also goes below the tray for approximately 5 mm. McAlpine siphon trap with capacity of 26 l/min and 20 mm high water seal is also included. Showerlay is complete unit with everything you need. Suitable shower drainage is included to former, it comes with 600 mm long steel linear end drain. It also comes with grating which is 64 mm wide, leaving 8 mm wide channel for water to flow. Grate Mistral has a row of various sized circles regularly covering the surface. Height from the shower tray surface to the top edge of vertical upstand is 15 mm, it also goes below the tray for approximately 5 mm. McAlpine siphon trap with capacity of 26 l/min and 20 mm high water seal is also included. Showerlay is complete unit with everything you need. 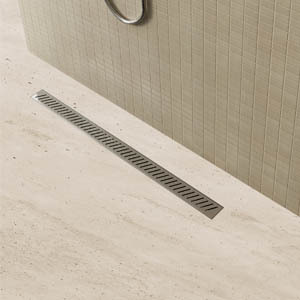 Suitable shower drainage is included to former, it comes with 600 mm long steel linear end drain. It also comes with grating which is 64 mm wide, leaving 8 mm wide channel for water to flow. Tivano cover has 4 L-shaped rectangles with a square in the centre pattern. Height from the shower tray surface to the top edge of vertical upstand is 15 mm, it also goes below the tray for approximately 5 mm. McAlpine siphon trap with capacity of 26 l/min and 20 mm high water seal is also included. Showerlay is complete unit with everything you need. Suitable shower drainage is included to former, it comes with 600 mm long steel linear end drain. It also comes with grating which is 64 mm wide, leaving 8 mm wide channel for water to flow. Sirocco cover holes pattern consists 3 rows of squares, parallel to drain edge. Height from the shower tray surface to the top edge of vertical upstand is 15 mm, it also goes below the tray for approximately 5 mm. McAlpine siphon trap with capacity of 26 l/min and 20 mm high water seal is also included. Showerlay is complete unit with everything you need. Chat started. Session ID: 1556251736. You are now connected to: David M.